A children’s book 40 years in the making will now help kids around the world! About 40 years ago I wrote this story with the help of ideas from my young adopted son, Scott, who was sadly taken from us a few years ago because of a long-term, off and on drug addiction. Scott was one of the most loving people I have ever known. Thinking about it has been almost unbearable. During much of his youth I was away from home a lot of the time due to my work. I have partially blamed myself for his problems. I cannot bring back the past, but through my involvement with Kiwanis I have tried to make life better for the youth in my community, and through the work of various funds, Kiwanis International has had a great influence on the lives of countless young people, from infancy through university. They sponsor clubs in schools like Builders Club, Key Club and Circle K. In communities around the world they have helped to eliminate disease and hunger. The Kiwanis Children’s Fund donates funds responsibly to help children around the world. A portion of all sales of this book will go to this marvelous fund. 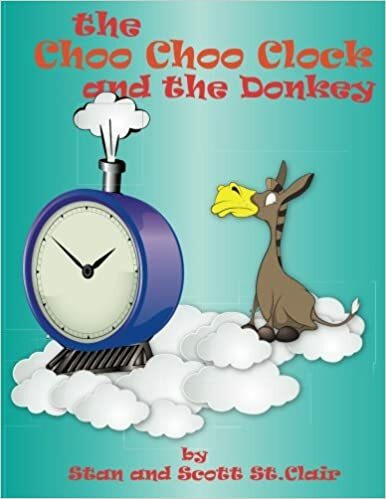 Today the book, The Choo-choo Clock and the Donkey, was released and Amazon is offering it on the Prime Day Special. Get yours today for a child near to your heart and help children around the world. This entry was posted in New book release and tagged Children's books, The Choo-choo Clock and the Donkey by Stanley J. St. Clair. Bookmark the permalink. I would love to buy a book for my grandson snd one for another child.